Altameas came to us desperate for a new smile. Her teeth were crooked, mal-aligned and periodontally compromised. 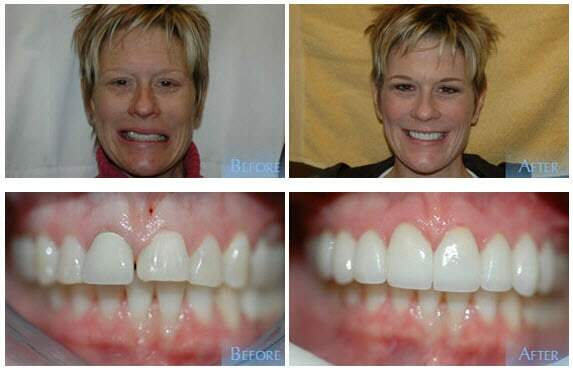 After treatment was complete, she found herself smiling more and overjoyed with the esthetics results. Cresenscio’s chief complaint was the appearance of his teeth. 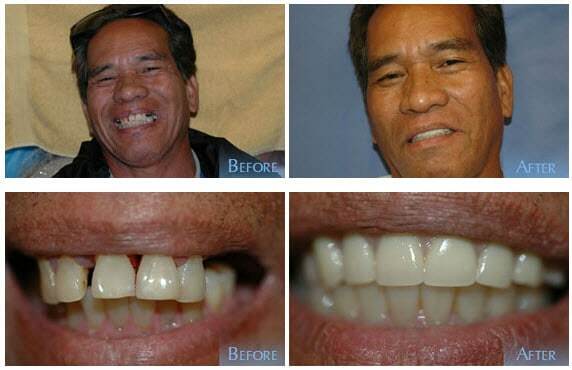 Our smile evaluation involved the correction of his periodontally compromised and shifting teeth. The treatment we performed gave Cresenscio the improved self-confidence he was looking for. Brenda just wanted to have nice teeth again and did not want to worry about taking care of them anymore. Her teeth were examined and a customized smile evaluation was completed. When she looked into the mirror, she couldn’t believe the reflection of her new self staring back at her. She has nice teeth again and can’t help telling everyone about it! Bret always wanted to have his teeth fixed for as long as he could remember. 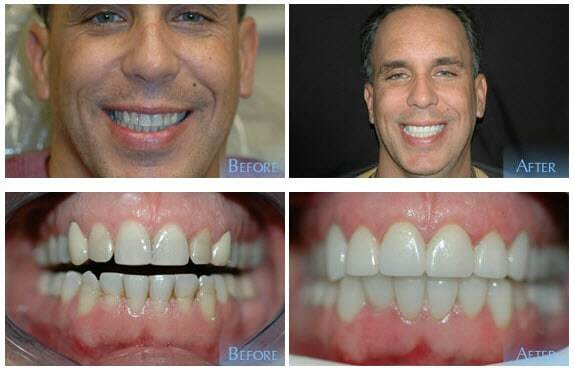 He had tetracycline-stained teeth ever since childhood and was looking for the right time to have them improved with porcelain veneers and porcelain crowns. He came to us to get his smile evaluation and consultation and after seeing his customized wax up on the diagnostic model, wasted no time in getting them fully restored. At his final appointment, he couldn’t believe the new smile he had and kept wondering what took him so long to have his teeth fixed in the first place. Erin did not like the stains on her teeth, but was fine with the shape of them. She had been a patient of Dr. Acosta for a couple years and was finally ready to have that smile makeover she had always promised herself. During her consultation, she told Dr. Acosta about her expectations, and upon completion of her procedure, Dr. Acosta took the time to make sure all her esthetic requirements were met. 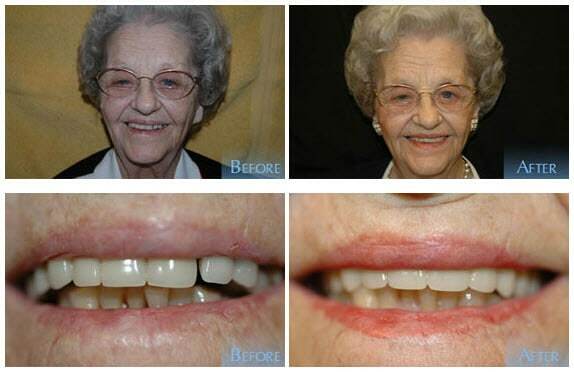 Irene’s existing dentures were many years old and her teeth were worn down and dark. 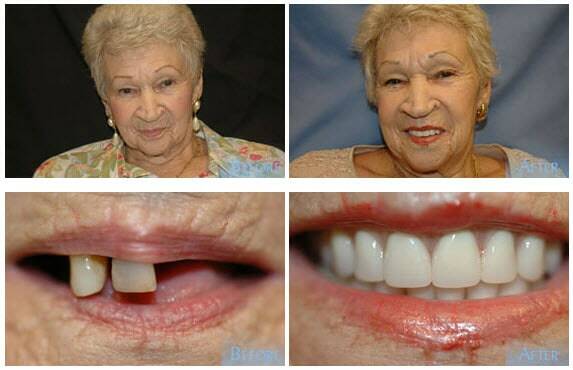 Her denture had cracked in half and was badly in need of replacement. 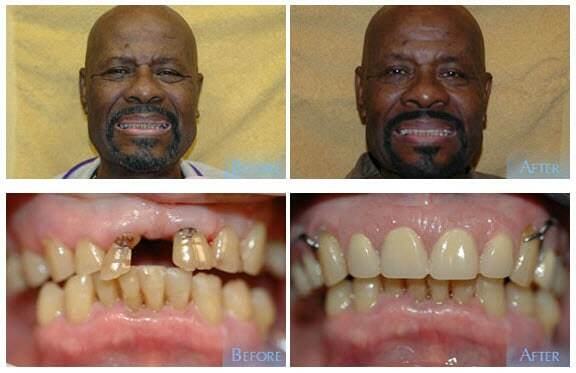 The after picture shows how custom esthetic dentures can dramatically change the appearance. Joseph’s teeth had been neglected for a very long time. He always had a big fear of dentists, but at long last it was time to get his teeth fixed. His brother (who is one of our patients) recommended us to Joseph, and upon his arrival, Dr. Acosta calmed his nerves by talking him through everything he was going to do to improve the issues he was having with his teeth. After the procedure was completed, Joseph looked in the mirror and was completely thrilledâ€¦not to mention forever grateful to his brother for helping him overcome his lifetime fear. Kristal wanted to have her teeth fixed. 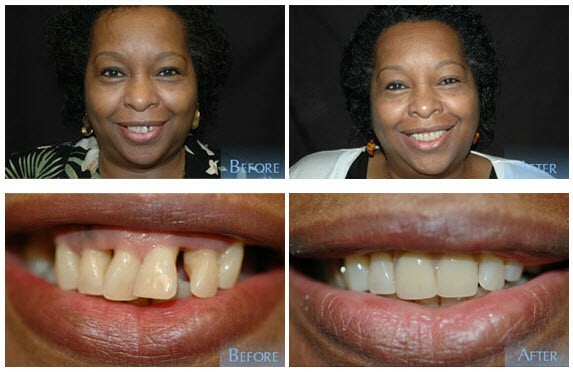 She was unhappy with her appearance and wanted Dr. Acosta to give her the natural appearance her teeth use to have. Now every time she looks at herself in the mirror, she can fall in love with her teeth all over again. 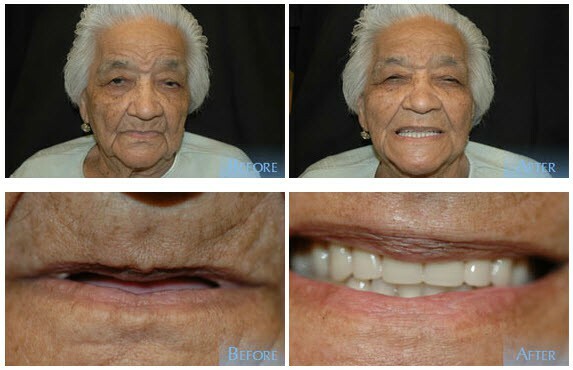 Hester had her dentures for a very long time and knew it was time to have them improved, giving her a revitalized smile again. Her teeth were discolored, worn down and shifting, and when she first met with Dr. Acosta, she knew right away that he was going to give her the smile she had always imagined. During each appointment, Dr. Acosta gave her the chance to be a part of the decision making, but nonetheless, on her final appointment, she kindly reminded Dr. Acosta that he better deliver on his promise. Dr. Acosta smiled back and stated he wouldn’t dare deliver anything less. Leonora came to Dr. Acosta’s office to fix her front teeth. She had discolored fillings between each tooth that were becoming a major distraction. 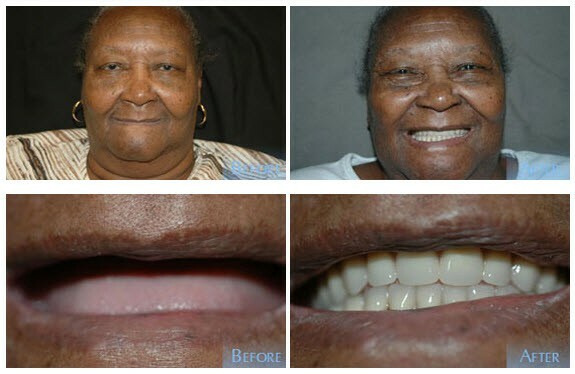 She was hoping to have better looking front teeth, and Dr. Acosta was able to remove the old fillings and put new resin fillings that perfectly matched the color of her teeth. It goes without saying that she was happy to see her teeth back to the way she once remembered them. Leandra’s daughter brought her to see Dr. Acosta for her dental treatment. She asked Dr. Acosta for a beautiful, wonderful smile, and Dr. Acosta spent his time during their initial appointment telling her that her request would be no problem at all. He made sure that she was involved with each decision and made sure to make each appointment fun and memorable. On her last appointment, when she had a chance to look in the mirror, she finally felt like herself again. She couldn’t believe the difference and is very happy that she took her daughter’s recommendation. Before coming to Dr. Acosta, Mae remembered herself as a talkative and lively person. But over recent years, she found herself becoming a quiet, withdrawn individual as she began loosing her teeth. Dr. Acosta looked at her on her first visit and assured her that everything was going to be just fine. She didn’t know what to expect and did not say much during her appointments, but Dr. Acosta took his time and made sure that she approved each step before moving on to the next appointment. She was very happy with the end results and, upon seeing her reflection in the mirror, found herself looking at someone from the past. She became that talkative and lively person again, and Dr. Acosta will never forget how she spoke more to him during her one week follow-up evaluation than all her other appointments combined. Her personality was definitely changing, and perhaps Dr. Acosta’s greatest success was helping Mae feel like herself again. Dr. Acosta for his smile makeover and was impressed with his outcome, so she knew she wanted the same results for herself. She had a diagnostic wax-up of her teeth on models, and after her procedure was completed, she could not believe the difference. Oliver came to Dr. Acosta to have his front teeth fixed. His wife wanted him to have that smile she once remembered, and after his smile evaluation, Dr. Acosta assured him that he would undoubtedly meet his (wife’s) expectations. After the procedure was complete, he could not believe how nice my teeth looked again. Shirley came to Dr. Acosta with mal-aligned, discolored teeth. She wanted to have a whiter, beautiful smile and requested Dr. Acosta give her a complete smile evaluation that involved diagnostic wax-up of models. During her initial consultation, she was able to evaluate the proposed appearance of her restored teeth; and, after giving Dr. Acosta her approval, was ready for her treatment to begin. 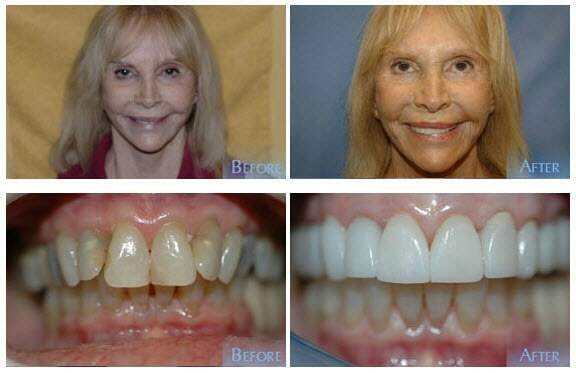 The treatment Dr. Acosta recommended was restoring her maxillary teeth with porcelain veneers and having zoom whitening done to her lower teeth. After all was said and done, Shirley was extremely satisfied with her new smile.